If you're a regular reader here, you probably know I've joined a few online cooking and baking groups along the way. It all started two years ago when I stumbled upon the Sweet Melissa Sundays baking group. I did a brief stint with French Fridays with Dorie. I'm currently baking out of the Baked Explorations cookbook with Club: Baked once or twice a month and cooking/baking along monthly with Secret Recipe Club. I love all these groups because a.) I learn things I didn't even know I wanted to learn, b.) I connect with fabulous food bloggers, many who are now friends, and c.) I get to eat some tasty stuff. I'm pretty excited to tell you about a new baking group that is a little different than the rest. This month I joined Operation Baking GALS. Baking GALS (GALS stands for Give a Little Support) is a group of volunteers that bake and ship home baked treats to soldiers deployed in a war zone. "Our goal is to show our support and send a little bit of home to remind them that we appreciate all that they do for our freedom." Pretty darn cool. The GALS started back in 2008 and have been baking ever since. You don't have know someone in the military to join. Though if you do know someone, you can nominate that person to be a recipient of the Operation Baking GALS goodies. Every month teams are formed, each representing a solider or soldiers to bake for. Baking GALS read about each team and choose one or more teams to join. Up to 20 people can join each team. All the teams bake and ship within the same 10 day period with the idea that the solider(s) get showered with all sorts of treats that they can share with the rest of the their unit. I sent my first box out on Tuesday to a solider overseas in the Air Force. The box included these homemade brownies and homemade ginger snaps. With a little extra room in the box I filled in the gaps with gum, candy, cornnuts and cup of noodles. It was a fun project to put everything together. Hopefully it brings a little taste of home to some of the brave soldiers who make freedom possible for all of us. 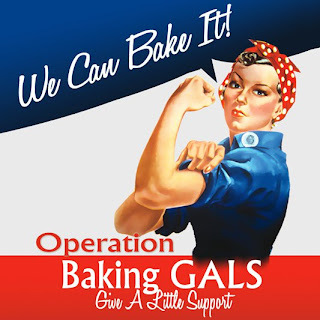 If you are interested in joining, head over to the Operations Baking GALS website and read through the FAQ's. The next round of baking will take place in June. Come and join the fun! On completely unrelated note, you might have noticed that today I've posted my first photo collage! Woo hoo! I've always admired blogs with a snazzy collage. A quick web search led me to easy breezy instructions on how to do it with my Lightroom 3 software. I'm looking forward to playing around with it. Meaning you can totally expect to see more photo collages here. P.S. Do something special for your the moms in your life on Sunday, May 13th, Mother's Day! What a fabulous idea! I am an avid baker (but without a blog) so I'm hoping I can still participate. I'm heading over to the site now! That's great! You can definitely participate without a blog. It's a great group and I'm already looking forward to the next round of baking in June. What an awesome idea, such a kind thing to do for those guys and gals busting their butts elsewhere! I too like the option of collages and I used Piknic but that's gone. I've thought about getting LR but not sure, do you like it?? Hi Gerry, I had a hard time using it at first. I've had it about 6 months now and feel like I really only know the basics. Keep in mind I'm not overly technical and have never used any type of photo editing program (unless you count microsoft office picture manager...LOL). I like how you can flag photos and do side by side editing comparisons. I will say it's helped me improve my photography by being more aware of my camera settings and getting the picture right so it needs less and less editing. I still do need to edit, however, and the tools in LR3 make a big difference. It definitely does the job! I do love the collage--I've been wanting to do the same. Glad you figured it out! Operation Baking Gals is a great group--there is so much good we can do. One just feels better when service is a part of your life. You asked a question about my Potatoes Au Gratin in the Crock Pot. I used russets--but think reds or Yukon Golds would also be excellent. I think 6 potatoes, medium size, are about 2 pounds. Good luck. Thanks for the tips on the potatoes. They turned out great and were a huge hit on Mother's Day! What a great group! I've heard about it before, but it's so fun to read about how it works and what you sent. And hooray for a collage! It looks great :) I'm totally intimidated by LR3. I keep thinking about taking the plunge but then I chicken out.